I just need, units that have morph, are the most complicated to copy. send me what you got and I'll make it work. Are there any specific units or models that give you trouble? If you send me the models, I can create a test map, and you can just copy&paste the XML data into your mod. That would be the best option if you don't want to upload the entire database just for testing purposes. "Anyone who has any morph abilities." incomplete sentence (I don't understand what your asking or stating). You send me the map/mod file with all the models (all of them) and whatever you have done I will link them together as a complete and working unit. I say this only because i rely want to see the Randor Warriors, Nullsector units, and new ued units released, unless there is a download link I am unaware of. The models are the same as the originals. They have not changed more than the texture. They are bia M3 to Xml, they do not lose properties in this way. Abilitie that change form, such as a command center transforming into a planetary fortress, or a building that uses the ability to fly. Theoretically, if you just change the model of the Command Center, it should theoretically change the appearance of the PF and OC, but I've never tried anything like this, so I could be completely wrong. Yes, but I'm doing an extra army, if I change the command center model, the terrans will have the UED command center. I created that test map with the command center for you, and you said it worked for you, right? How about I do that again - creating a test map with new units that have working morphs, and you just copy&paste the XML code into your modfile? Give me a list of units you need, and I'll see what I can do. How did you have UED V2 and V3 models?! I hadn't even thought that Alleyviper had even made the UED stuff with anything but yellow, I'd assumed he had, but I never though blue, Damn they are gorgeous, but seriously, how do you have models from that far back? At first it was teal, but I put yellow, because of a vote that was made in my section of Assets. between orange, yellow, teal and another color (I do not remember) and the yellow color was chosen by votes. The 1st version of UED, I did it wrong. the 2nd version is an improved version but with many problems in many units and structures. The 3rd, is the official version and matching the tone of the textures, reducing the number of textures and extra parts in the models, is more compact. By the way, does anyone know the name of the blue background texture of the buttons? In what Layout file are the colors of each race? You can just post them in a new layout file. Constant values don't need to be defined in a specific contained, thankfully. After doing some testing, it seems this only affects the color of the weapon/armor symbols, as well as the queue field (you know, where it says 1,2,3,4,5). Everything else uses textures. 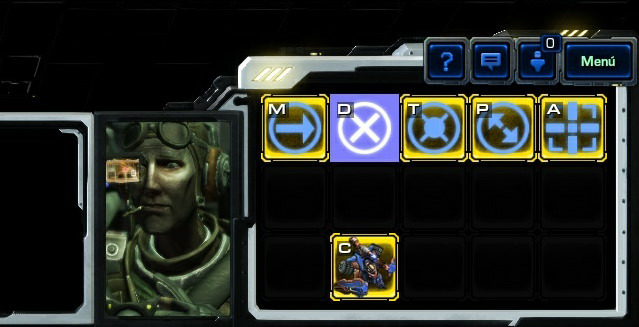 I'm trying to find all textures for Terran and recolor them to yellow. Give me a day or two and I should be done with this.